New design, made of metal yet is lightweight and strong. Use for self defense purposes only! Not a toy, although it looks like one. 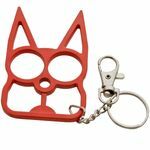 This unique Cat defense keychain packs a sharp punch! The eyes of the cat become finger holes and the ears become spikes when clutched in your hand to create an excellent means of surprise-defense against an attacker. The finished stainless aluminum charm includes a stainless ring for attaching keys. Finger holes are about a 12.5 ring size. This keychain looks non-threatening, is easy to carry, and will provide you with peace of mind! Size 3.14 X 1.96 inch. Weight: 1.5 oz. This is about the weight of 7 quarters. These are smaller than other cat knuckle keychains made of plastic. Really just a bit more than 2 fingers wide. Can be used for punching, slashing and tearing. Saves your hand from injury while wreaking havoc on the assailant. A force multiplier making your strikes much more effective. 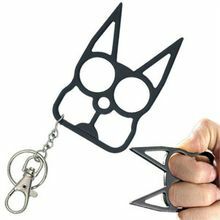 So cute, all your friends will want the Cat Keychain for their self defense. Colors available: Black, Pink, Gold, Blue ,White, Red, Copper, Purple, Dark Pink, Neon Green and Shiny Gold(+.49) See drop down menu to choose. The Shiny Gold model has a more polished finish. The regular gold has a matte finish. Other vendors sell same items for $9.99 each. Don't pay more.